Savor the autumn flavors of butternut squash, cranberries and maple syrup in this hearty salad. Bring a pot of water to boil and add the Farro. Let the Farro simmer for about 20 minutes until done. Strain and rinse with cool water. Place diced butternut squash on a baking tray and drizzle with olive oil, salt, and pepper. Bake at 350 for 30-40 minutes or until the butternut squash pieces are soft. 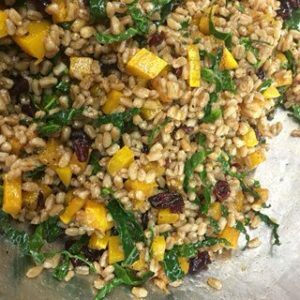 In a large bowl combine the farro, butternut squash, thyme, cranberries, and kale. In a small bowl whisk the maple syrup, balsamic vinegar, and extra virgin olive oil together. Add it to the Farro and toss together.